Jenny of ELEFANTZ: Are you enjoying the fruits of your labor? 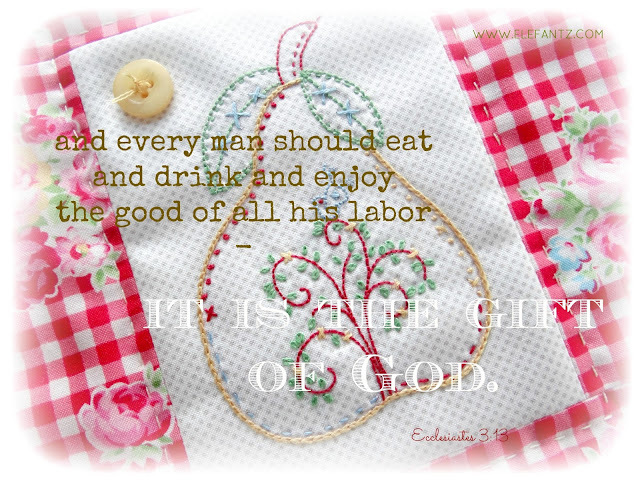 Are you enjoying the fruits of your labor? Ecclesiastes isn't often on my reading list and that's not a purposeful avoidance by any means, it just isn't where my Bible opens most days, weeks or even months. "and also that every man should eat and drink and enjoy the good of all his labor - it is the gift of God"
You may think me odd, and to be sure in many ways my husband would agree, but both days my reading of this verse brought forth in my mind a picture of a large freshly baked apple pie. The pie had one piece missing and I felt within myself a deep satisfaction, as though I were the one who had baked the pie and eaten that delicious slice. Now that's not something which would happen in my kitchen. I bake for the family and it is from my love of serving them that when a pie such as this is placed on the table they are always served first. Generous slices are cut and slipped into aged dessert bowls with scoops of ice cream on top for all to enjoy, and only after everyone is seen to do I attend to my own piece - and I see nothing wrong with that. But I sensed with this Scripture that God was wanting to make a point with me. My life runs on a track of serving, working, giving, working more, serving more, giving more...all with good intent, loving intent, giving intent. I grew up watching my Nana do this and her example is the only one I knew to follow so it was natural that her rhythm of life would become mine, and the rhythm of my life would have an effect on my daughters years later. What I failed to realise until now was the lack of Ecclesiastes 3:13 in Nana's life, in my life. That 'vision' I had this week of the fresh baked apple pie with a slice eaten filled me with delight, a wonderful sense of satisfaction in work well done. It was as though I'd spent the morning picking apples, peeling, chopping, stewing them with a little sugar and cinnamon for the pie filling. Then I would have rubbed butter and sugar into flour and deftly made pastry dough, rolled it out and blind baked the pie case before filling it with the cooled apples. Another roll of dough and perhaps a lattice criss-cross of half inch strips like Nana would do across the top, a few leaves cut from the pastry scraps pressed onto the centre, a sprinkle of cinnamon sugar and into the oven to bake. A tidy of the kitchen bench, wash the bowls, sweep the floor, hang up my apron and 'ping' goes the kitchen timer - my pie would be ready! "and also that every man should eat and drink and enjoy the good of all his labor..."
I don't wait for the family dinner. I brew the kettle, choose my favourite tea cup and pretty cake plate and I cut into that apple pie. One lovely thick slice, the fruit of my labor to enjoy. No guilt. No rushing to do other things. Not today. I savour every delicious morsel because I'm relaxed, just letting myself delight in the reaping of my 'harvest'. "...eat and drink and enjoy the good of all his labor - it is the gift of God"
Don't forget to enjoy life, to enjoy the fruit of your labor, to enjoy the gifts of God. Working, serving and giving are very important and we must continue doing those things, especially from the heart with generous and loving motivation - but we must also laugh, breathe, embrace each day, be kind to ourselves, learn to say no sometimes, and enjoy the fruit of our labors. It's not just about apple pie, though sometimes it may well be. It's about stopping to enjoy what you've put effort into - whether that be a relationship, a project, an event, a harvest, anything that required something from you. There's something else I should mention. Teach this to your children if like me your example has been one of too much work and not enough enjoying the fruits. I see two of my girls especially, who diligently care for their families and expect nothing in return because they love being wives and mothers, they delight in being homemakers, and find ways to work from home. I see them weary, burnt out, laughing a little less and in need of a harvest. I see a bit of me in them already and think it's time to update the family rhythm. It's time they knew about Ecclesiastes 3:13 too, so they can teach their daughters. Be blessed dear child of God, you are worth more than you know. Great post! Hit the nail on the head! Nicely put Jenny. Love yourself and loving others. This has brought tears to my eyes. Thank you for sharing what the Lord is teaching you. I have always put myself last and I see my oldest daughter doing the same thing. Time for a change! This post sure hit home to me. In life at times it seems you lose yourself and care for others not yourself. I am a care giver to my husband and at times it is difficult. Going for walks, stitching and reading help. Thanks for your words of wisdom. I've never been a blogger follower before but just reading your words brings such a calmness to me. It's like you "Know" what I need to hear at just the right time. Thank you for sharing your talent with the rest of us. I would like to know is there a pattern for the pin cushion that is pictured above the stitchery club? I have a weakness for pin cushions. This was a beautiful reminder that we are cherished women of GOD and HE wants us to delight in HIS gifts as well as share them with our precious ones. I loved your "vision". An illustration just pupped into my mind. Imagine preparing a precious one, his/her favorite dessert and instead of sitting and thoroughly enjoying it, this one felt the need to complete the to-do list for the day. Imagine your anxiously awaiting for the precious one to hurry, complete the list, and finally sit and take that first bite. Perhaps this is another picture of what our Heavenly FATHER encounters too often with us. Hello Jenny! Thank you for sharing with us this special message. It truly amazes me the way the Lord works through you, for you and for us exactly when we all need this special message. Plus, he has you explain it to those of us who do not always understand what we are reading in His Word. I treasure the day the Lord led me to you! Have a splendid day! WOW! This was an eye opener. You explained it so beautifully. My New Year's resolution is to take better care of myself which includes not just diet and exercise but also things like a new skirt to feel good in. I always feel guilty when I do something for myself ahead of others. Your post today really helped with those feelings. Thank you. You write so beautifully and express what many women would like to but don't have the exact words. Thank you for taking the time to share your thoughts and wisdom. Your stitchery is exactly what is needed for this scriptural verse. Thank you, Jenny, for making this vision come so clearly. Amazingly, that's word for word the same as the KJV that I love so dearly. I'm so grateful that the last five years of Paul's life, we did exactly that ... we enjoyed the fruits of our labor, together, doing wonderful things and lots of nothing, too. What a blessing it is to me to look back and see how we took time to enjoy each other's company for five beautiful years, the fruits of a lifetime together, serving our family. Jenny, your blog posts always touch my heart! Thank you so much for sharing...you are a wonderful inspiration in more ways than you know! Thank you Jenny for sharing! These thoughts and discoveries of whom we are run so deep as only our Lord can minister to our heart and soul. God Bless! Such a beautiful post Jenny. You have a special way of writing that is good for the soul. This sounds so very much like my life. I have always put others before myself, just like my mum does and I guess her mum also. And I can see my girls are very much the same. My motto in life is to Love God, love others and this is what I try my best to do, but I must also do more of what I enjoy. This post really hit home for me. A timely reminder to re-organinise my schedule so I can fit in a little me time too. Thank you Jenny for sharing the good message God has given you. It is a very important reminder to stop and enjoy the gifts God has given us. A loving and giving home is a great gift and the best way to stay centered is to be a little more like Mary and a little less like Martha. Always your words full of wisdom. Love for effort and good work is important. Although nobody sees your effort, God and you know. And that is enough. I hope your whole family is well. Many hugs. God bless You. I love every one of your blogs and this one especially. Thanks for putting it so eloquently! Thank you so much for these good words. I tend to do the same and not take time for myself to enjoy the fruits of my labor. Someone recently told me that I need to take care of myself and enjoy life more instead of always working at something or other for someone else. You have confirmed that here as if God was talking straight at me through your writing, and I will try to take these words to heart. I so enjoy reading your blog. Bless you.